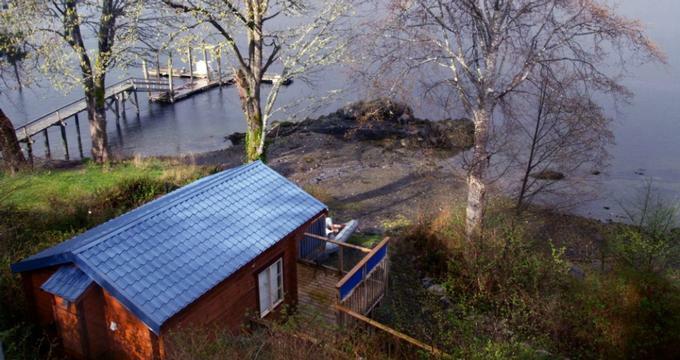 Overlooking Ucluelet Harbor on the shores of the Kennedy Lake, Anchors Inn is a lovely lakeside retreat that offers rustic, secluded cabins with kitchenettes, private bathrooms, and tree-shaded sun decks with beautiful harbor views. Ideally situated for exploring the beauty of the area, which includes the rushing waters of Kennedy River, the Wild Pacific Trail, and the white sands of Long Beach. The Inn enjoys direct access to a pretty pebble beach, and storage and launching facilities for canoes and kayaks for use on the lake and is a short walk to the Main Street of Ucluelet where there are shops, restaurants, art galleries and quaint cafés. Anchors Inn features comfortable accommodations in the form of two water-front cabins and a luxurious waterfront suite. Set on opposite corners of the half-acre property, the cabins and suite are private and secluded with unobstructed views of the ocean. Situated just a few steps from the beach near the mouth of Ucluelet Harbor, the two cabins are self-contained with queen-size beds in luxury linens with down comforters, and three-piece bathrooms with bathtubs, showers, and single vanities, fresh towels and organic bath products. Fully equipped kitchenettes have cooking facilities including stove tops, fridges, and sinks, as well as microwaves, coffee makers, pots and pans, dishes, and cutlery. Cabins also feature large sundecks with double jetted soaking tubs, outdoor barbecues and bistro sets, electric fireplaces with multiple settings and unlimited hot water. Modern amenities include televisions and DVD players, stereos and CD players, binoculars, flashlights, hair dryers, and complimentary wireless Internet. The One-Bedroom Waterfront Suite is a self-contained suite with a full bedroom, an en-suite bathroom with a soaking bathtub, walk-in shower, fresh towels and organic bath products, and a spacious living area with comfortable sofas and armchairs. A fully equipped kitchenette has cooking facilities, including a stove top, fridge, and sink, microwave, coffee maker, pots and pans, dishes, and cutlery and a large private deck have a four-person hot tub, barbecue grill and a bistro set of tables and chairs. A complimentary breakfast is served every morning in the sunny dining room or out on the deck overlooking the harbor and includes cereals, granola, yogurt, fresh fruit, juices, hot entrées and egg dishes, freshly brewed artisan coffee and organic teas. Anchors Inn serves guests a gourmet breakfast every morning in the sunny dining room or out on the large deck overlooking the harbor. The town of Ucluelet offers an array of activities and attractions, ranging from hiking, mountain biking, and kayaking to fishing, whale-watching, and scuba diving. The world-renowned Wild Pacific Trail is a short walk from Anchors Inn and attracts hikers from all around to savor the spectacular natural beauty of the trail, the Long Beach Golf Course offers nine challenging holes of golf with beautiful surroundings, and the Pacific Rim National Park is a short drive away.